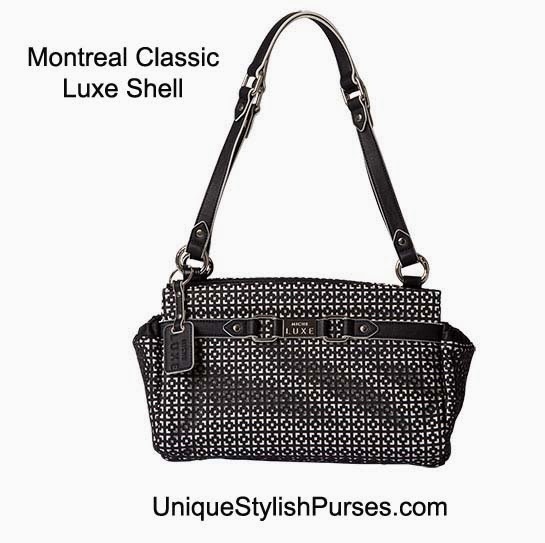 Montreal Luxe for Classic Miche bags is breathtakingly elegant and the styling is reminiscent of French haute couture. Feather-white faux leather is overlaid with an exquisite laser-cut perforated pattern in deepest black. Illusion belt detail and silver hardware complete the look. Comes with matching handles, key fob and dustcover. End pockets. Handle length: 23 ¾”; width: ¾”; handle drop: 11 ¼”.